Get your scalp clean with this DIY exfoliating scalp scrub recipe made with peppermint infused avocado oil. I'm going to get real with you guys. I have thick hair. Thick hair and this heat and humidity does not mix well. I feel like I'm wearing a helmet that traps heat against my heat. What I'm trying to say is that sweat happens. Couple that with styling products, and my scalp feels gross. Even though I wash my hair three times a week, I still feel like my scalp doesn't get clean, you know? I used a coal tar shampoo to really get my hair clean, and it worked. My hair was so soft! But I'm afraid to use it until it's almost time to get my hair colored because it can strip the color out of your hair. You probably use a sugar scrub to exfoliate your body and feet, and you probably exfoliate your face often, but when was the last time that you exfoliated your scalp? I'm willing to bet that it's been never. Your scalp produces oil in sebaceous glands. When your body produces too much oil, it can lead to a dandruff caused by a yeast, or it could even lead to seborrheic dermatitis. If if you don't have dandruff or red, itchy patches from deborrheic dermatitis, it's still a good idea to scrub your scalp once a month. Over time, the excess oil that your body produces can clog your hair follicles. Eventually, this can lead to thinning hair or even hair loss. Exfoliating your scalp also helps get rid of product buildup, including dry shampoo. If you love dry shampoo as much as I do, then it's very important to scrub your scalp. Regular shampoo alone usually doesn't get rid of product buildup. Even using a clarifying shampoo isn't enough. This DIY exfoliating scalp scrub recipe has ingredients I specifically selected for helping your hair and your scalp. Epsom salts are wonderful for keeping your hair looking good naturally. It gently scrubs to unclog pores and unblock your hair follicles. It also helps dissolve product buildup and remove excess oil from your scalp. The minerals in Epsom salts help restore damaged hair and work to strengthen your hair, so it can help your hair look better almost immediately. Lemon juice isn't often used in DIY hair recipes, probably because of the risk of lightening the hair. You aren't using enough or leaving it on long enough to worry about that in this recipe. It's high in vitamin C for strong hair. Limonene in the juice can help reduce frizz. The acid in the juice helps clean the scalp and remove product buildup. Although you're making an herbal infusion for this recipe, the benefits of the peppermint still transfer to the avocado oil. Using the dried herb would be quite messy, but this gives you all of the good stuff without using the actual dried herb in the recipe. When used as the dried herb, peppermint is often used to soothe the scalp. It can also promote hair growth. It's cooling, so it feels great on an irritated scalp. It probably won't feel great on a scalp that's so irritated that you have broken skin, so see a doctor if that's you. I chose avocado oil because it's so wonderful for your hair. There's some evidence that if you use a vegetable oil near your scalp that it coats the hair follicle. This can help prevent damage to your hair, which could result in thicker growing hair. Monounsaturated fats are better able to penetrate the skin, and avocado oil is high in monounsaturated fats. The oil is very moisturizing, which can prevent flakes from dry skin. You can use other carrier oils. Read this post for the best carrier oils for the hair. Before you use this exfoliating scalp scrub, use a teasing brush to brush your scalp. Use gentle strokes because this can be irritating to your scalp. Then you want to massage this scalp scrub into your scalp for about 10 minutes. 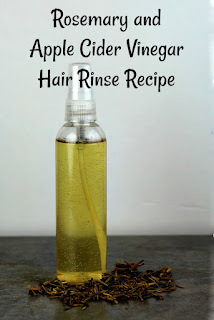 This will help loosen the excess oil and product buildup and exfoliate your scalp. Rinse well and use your regular shampoo and conditioner. You should use this scrub about once a month unless you have dandruff or flakes. Then use it every two weeks until your scalp feels better and then once a month. Place about half of a cup of dried peppermint leaves in a 8-ounce mason jar. Cover with avocado oil. Let sit for two weeks, giving it a gentle shake each day. If you want the oil and herb to infuse faster, you can set the mason jar of herbs on top of a canning lid and set in a pan of water. Heat for 20 minutes to infuse the oil. Learn you can learn more about infusing herbs and oil in a separate post, which explains the process more. When the herb and oil are infused, pour the oil through cheesecloth or a fine sieve to strain out the herbs. Use a spatula or the back of a spoon to gently press the oil out of the herbs. 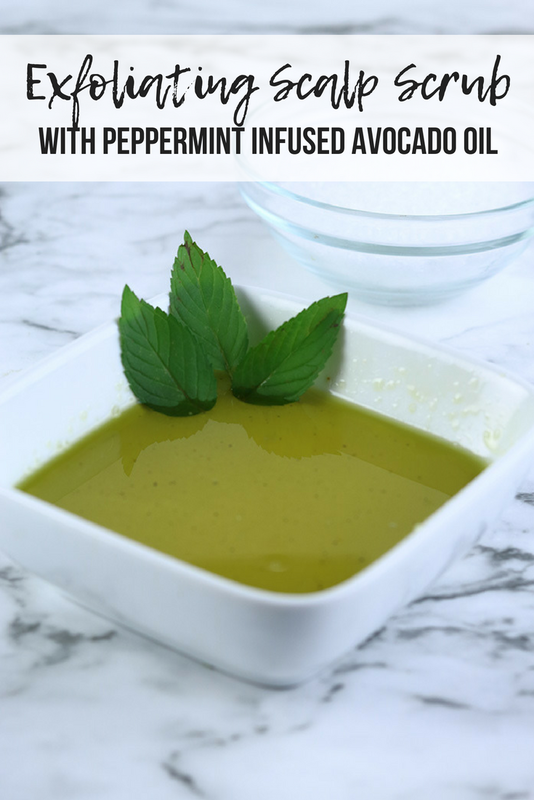 You're now left with peppermint infused avocado oil, so it has some of the benefits of the peppermint. Combine the Epsom salts, lemon juice, and oil in a small bowl. Stir well. You'll have some peppermint infused avocado oil left. It would be wonderful in most recipes, but I think it would be especially good in a foot cream or in a sugar scrub. Just use it in place of the carrier oil and don't use peppermint essential oil with it. 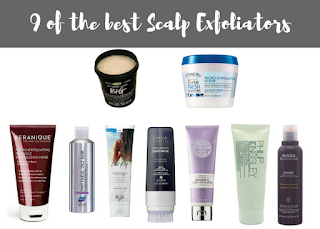 If you want to use a scalp scrub but don't want to make one, try one of these 9 best scalp exfoliators.